Chocolate-y treats and kisses are everywhere on Valentine's Day. Why not combine the two? Whip up these three varieties of cocoa-flavored lip balm – held in adorable heart-shaped containers – for the sweethearts in your life. Who knows? Maybe you'll get a thank-you smooch. 1. Scoop two tablespoons of cocoa powder into a small, microwave-safe bowl. Wipe off any powder in the spoon with a paper towel, then add nine tablespoons of Vaseline blend. Mix with a teaspoon until combined, about two minutes (it will look like cake frosting). 2. Cover bowl with a paper towel and microwave 30 seconds. Remove and stir with a teaspoon. (Mixture should be warm like melted chocolate chips, not bubbly hot.) Heat an additional 15 seconds in microwave if needed. 3. Scoop warm cocoa jelly mixture into six heart-shaped containers using a teaspoon. Place filled hearts on a paper towel. Spoon extra cocoa mixture into a clean container with lid as your own refill, cooling 30 minutes before covering. 4. Use the eye dropper to put three drops of vanilla extract into two hearts, gently stirring with a table knife or toothpick to mix. Rinse dropper in sink and wipe knife clean, then repeat with two more hearts, using peppermint extract. 5. Level the top of lip balm in each heart with your index finger. Wipe any extra off sides of jars with a paper towel. Clean your hands as needed (this gets messy) with paper towels. 6. Use the marker to write a “V” for vanilla and “M” for mint on the paper towel next to those flavored hearts to remember later. Allow lip balm to set at room temperature for 30 minutes (mixture won't harden completely). 7. Place lids on all the hearts, then put a red heart sticker on top of each. 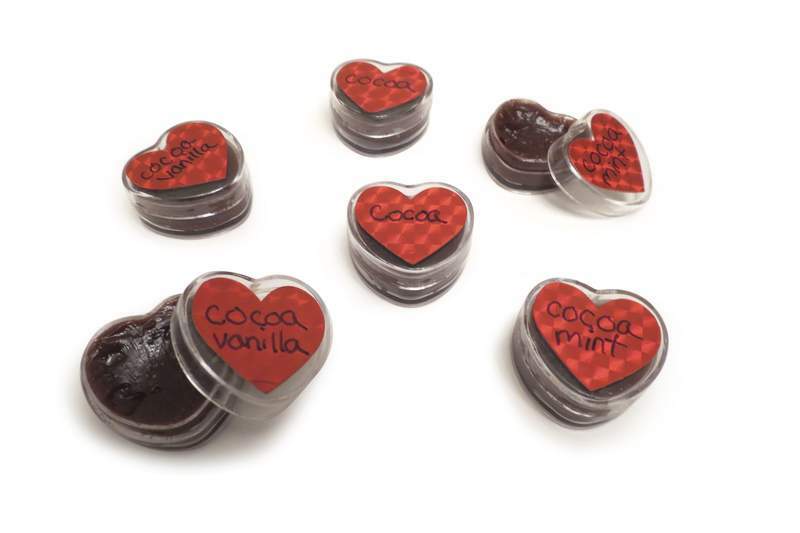 Label each jar's flavor (cocoa, cocoa vanilla or cocoa mint) on the stickers with a marker. 8. Share your kissable creation with loved ones.